WiFi NINA click is a powerful standalone WiFi module, equipped with the state-of-the-art NINA-W132 module from u-blox, that can be easily configured with the u-blox s-center software, using AT commands. WiFi NINA click offers a complete WiFi stack, it is really easy to use and provides a simple way to build secure IoT applications. This WiFi module integrates a powerful dual 32bit MCU and a radio for wireless communication. It comes with preprogrammed application software that supports 802.11b/g/n in the 2.4 GHz ISM band. 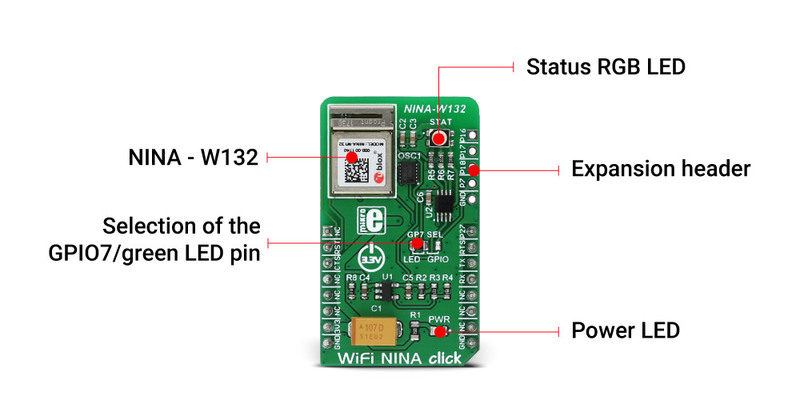 WiFi NINA click also features an RGB diode, which is used to display the connection status of the device. These features make this click a perfect and secure IoT solution. It can also be used for any type of WiFi networks, medical and industrial networking, home/building automation and other applications that require wireless network access. The module used on WiFi NINA click incorporates powerful dual MCUs and a radio for wireless communication. Two 32bit MCUs, operate at the maximum frequency of 240 MHz. The module is also equipped with an internal PIFA antenna, specially optimized to fit the NINA form factor. WiFi NINA click uses UART to communicate with the MCU. It supports a wide range of UART baud rates, including some less common rates, up to 921600 bps. The data transfer pins (RX and TX) are routed to the corresponding mikroBUS™ pins for easy interfacing with the host MCU. Besides these pins, this click has several more pins routed both to mikroBUS™ and onboard pads. RST pin of the mikroBUS™ is routed to the Reset pin of the NINA-W132. It can be used to reset the module. Bringing this pin to a LOW logic level will cause a reset and will put this device into a very low power consumption mode. This pin is in an open-drain configuration, and it is internally pulled to a HIGH logic level. CTS and RTS signals of the NINA-W132 module are routed to the CS and INT pins of the mikroBUS™, respectively. These pins are used for implementing a hardware flow control. DTR and DSR pins are used for configuring the WiFi NINA click. These pins are not routed to the mikroBUS™, but are routed to the onboard pads instead, so they can be used externally. For a low power operation, an external low power oscillator (LPO) has to be added. WiFi NINA click features the SG-3040LC, an external oscillator with the controllable output voltage, supplied by the AP7331 LDO regulator. It outputs 32.768 kHz signal with an amplitude of about 0.7V. The demo application available for this click demonstrates the usage of the WiFi-NINA click library functions and the proper initialization sequence. It can be used as a reference for any custom design. The libraries contain simple and easy to use functions for sending AT commands to the NINA-W132 module and getting the responses back, saving users from having to write rather complex code for the response interception and other time-consuming software elements. This table shows how the pinout on WiFI NINA click corresponds to the pinout on the mikroBUS™ socket (the latter shown in the two middle columns). We provide a library for WiFi NINA click on our LibStock page, as well as a demo application (example), developed using MikroElektronika compilers and mikroSDK. The provided click library is mikroSDK standard compliant. The demo application can run on all the main MikroElektronika development boards. The library contains a generic command parser, adopted for AT command based modules. System Initialization - Initializes all necessary GPIO pins, UART used for the communication with GSM module and UART used for information logging. Application Initialization - Initializes driver, power on the module, and it enables hardware flow control. Commands sent after initialization are checking communication with the module, disabling echo and checking the firmware version. Finally, a command for WiFi networks in area scan is sent. Application Task - Running core state machine necessary for successful message parsing. Timer initialization, timer ISR, and default handler. This click board is supported with mikroSDK - MikroElektronika Software Development Kit. To ensure proper operation of the mikroSDK compliant click board demo applications, mikroSDK should be downloaded from the Libstock and installed for the compiler you are using.